The main protagonist of Mobile Suit Crossbone Gundam. He's the pilot of the Crossbone Gundam X3. 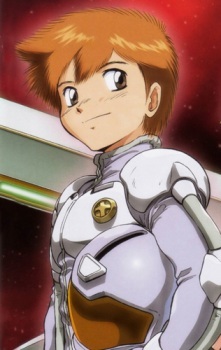 After arriving on Jupiter with a group of exchange students on Earth, he got involved in the attack by the Crossbone Vanguard. He's often short tempered, letting his emotions get the best of him in the battle. Kincaid continues to help him throughout the story. He's voiced by Kappei Yamaguchi in various games.